Every year, HGTV searches for a gorgeous location to serve as the setting for that year's Dream Home. Previous locations have included Park City, Utah, Stowe, Vermont, and Sandia, New Mexico. In 2013, the HGTV Dream Home went back to the water with a location in Kiawah Island, South Carolina, which offers romantic beaches, gorgeous golf greens, and a location just a short hop from the lovely southern city of Charleston. Kiawah Island, South Carolina is one of the barrier reefs that protect the mainland. It has been privately owned since 1699, when a pirate named George Raynor was granted the land to grow rice and other commercial crops. In the 1950's, it was purchased by a commercial developer who created a "well-designed beach resort with amenities and activities to meet the needs of the entire family," according to The Travel Channel. Kiawah Island's maritime location causes it to be warmer and more temperate than even the city of Charleston, which lies only 21 miles away. According to the book, "Kiawah Island: A History" by Ashton Cobb, Kiawah Island has "a very fine winter climate, preferable in some respects to that of Florida." In 2012, Dr. Beach named the Beachwalker Park on Kiawah Island the 9th Best Beach in America. Travel Channel rates the beaches on Kiawah Island as 4/5 for sand and swimming and 5/5 for atmosphere, saying Kiawah is an idyllic setting offering the best of beach, sport and proximity to a nearby city. In 2009, National Geographic Traveler named Beachwalker Park, Kiawah Island one of the Top 10 Beaches in America. So if you love to sun yourself on the sand, swim in the breaking waves, or kayak or canoe through tidal marshes, you'll definitely want to try to win the 2013 HGTV Dream Home. Kiawah Island offers many other activities in addition to their lovely beaches. It sports three major golf courses, including one (Turtle Point) designed by golf superstar Jack Niklaus. Kiawah Island has hosted some notable golf tournaments including the PGA Championship, the Ryder Cup, and more. 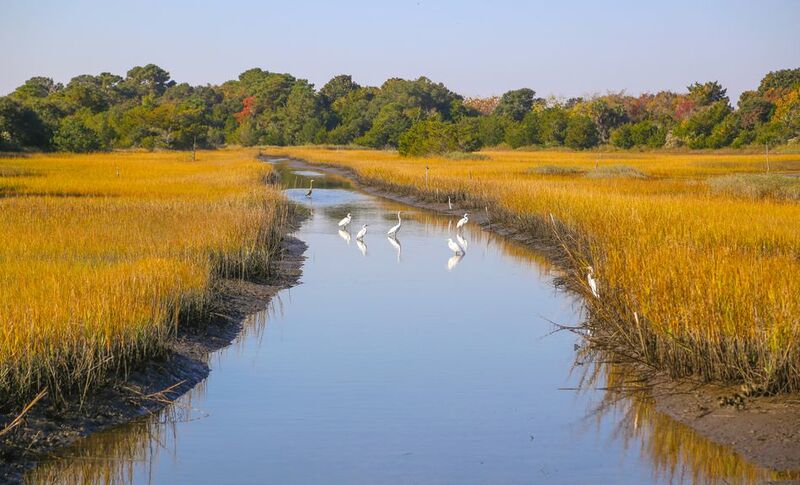 Kiawah Island also boasts 10,000 acres of woodland, which gives many opportunities for camping, hiking, paddling, biking, and other wilderness activities. And the Kiawah community gets together for social events like outdoor concerts, performances, dancing, and more. The Dream Home 2013 will be built in a new community called Indigo Park. Indigo Park is a green community, with an emphasis on environmentally-friendly building. There will be a total of 16 homes in the Indigo Park community, nestled among giant oak trees. The community is set near a beautiful marsh, and is adjacent to a three-acre community park. The 2013 Dream Home received a Platinum LEED Certification due to its earth-friendly construction methods. The 2013 HGTV Dream Home is designed to take full advantage of its surroundings in the South Carolina lowlands. The landscape of Kiawah Island features verdant marshes, beaches, and woodland as well as typical Southern charm. The 2013 Dream Home is a "three-bedroom, 3,000-square-foot 'low-country Zen-style' home," as described in the HGTV's location announcement. The 2013 HGTV Dream Home is a two-story home with a full garage and separate playroom. The main floor is elevated to protect against flood damage, a prudent choice for any home on a barrier island. The 2013 Dream Home is designed to encourage its owner to enjoy the great outdoors, with a lovely front porch and a wrap-around deck. If your vision of a true Southern home includes rocking chairs and porch swings, the Dream Home will satisfy. The main floor of the home includes a gourmet kitchen with a separate pantry, the laundry room, a dining room that's open to the kitchen (perfect for entertaining), the master bedroom suite including a large bathroom, and a great room to spend time with friends and family. The second floor of the 2013 Dream Home includes a loft overlooking the great room, a guest bedroom with its own bathroom, a children's bedroom with its own bathroom, and a "bunk niche" which makes a great place for young guests to sleep and play. The garage offers space for two vehicles, plus a ton of storage for sporting equipment, kayaks, and more. The playroom isn't just for little kids. It also makes a great "man cave" with room for a ping pong table, lounge chairs, day beds, and more. The front yard of the Dream Home overlooks the island's marshlands. The HGTV worked to save existing vegetation like looming oaks and palmettos, which add beauty to the property. The yard was landscaped to combine an attractive appearance with a sustainable environment. For example, the run-off from the home's roof goes to water-loving plants in the garden. Nearly all the plant life is native to the area. The location of the 2013 HGTV Dream Home offered some challenges for its builders. South Carolina's barrier islands are beautiful, but they are often buffeted by harsh storms which bring hurricane-strength winds and the threat of floods. And to top it off, there can also be earthquakes. They raised the home eight feet above ground level, to protect against flooding. Structural elements are joined together not just with screws but with strong steel brackets to protect against buffeting winds. The window glass was lab-tested to be strong enough to remain unbroken when shot with a cannon, to withstand the toughest storm. They used special sealant in the outer walls and roof to protect against water damage. The home is sided with cellular PVC siding that can withstand salt air, moisture, and parasites, to keep the Dream Home looking great and structurally sound for years to come. In addition, the builders of the 2013 HGTV Dream Home set themselves an additional difficult goal: they wanted their home to be so environmentally-friendly that it would qualify for LEED platinum certification. LEED Certification is a third-party rating system designed "to enhance environmental awareness among architects and building contractors, and to encourage the design and construction of energy-efficient, water-conserving buildings that use sustainable or green resources and materials." LEED certification assigns points in nine different areas including Indoor Environmental Quality, Water Efficiency, Regional Priority, Innovation in Design, and more. The number of points a building receives determines the level of certification. The 2013 HGTV Dream Home achieved the highest level of LEED certification, Platinum status, indicating that the construction of the home put an extremely high emphasis on environmental impact and energy-consciousness. Every year, the HGTV Dream Home's setting influences its look and feel, and this year is no exception. The Kiawah Island location invites the Dream Home's owners to enjoy the great outdoors, and the home design takes full advantage of the beautiful marshland on its doorstep. The design goal was to combine zen-like simplicity with understated beauty. The result? Cool colors borrowed from the island setting, a sleek design aesthetic, water features like an infinity pool, and enormous windows and open spaces indoors, to bring the feeling of the great outdoors into the home. Over 77 million people entered to win the 2013 HGTV Dream Home. The lucky winner was a former marine from Tennessee named Carole Simpson. Who's Won the HGTV Smart Home Sweepstakes? What If You Can't Afford the Taxes on an HGTV Dream Home?